Carolyn Smaka: Thanks for joining, Barry. Today we’re going to discuss disruptive innovations, and how hearing care professionals can leverage new trends. Can you explain what a disruptive innovation is? Barry Freeman: The term disruptive innovation comes from Harvard’s Clayton Christensen and his book The Innovator’s Dilemma. I think it’s easier to define by example. Cellular phones are a great example. They disrupted both the home landline phone market, as well as the camera and video recorder markets. Who would have ever imagined that everybody would be walking around with a camera in his or her pocket? I teach AuD classes at various universities around the country, and I always ask the students, “How many of you have a fixed land line phone at home?” Over the last two years, I haven’t found any students with a home phone; they just use their cell phones. That, to me, is a true disruptor in the market. Regarding our industry, Costco can be seen as a disruptor in the market. I’m not sure it’s truly an innovation, since they have not grown the market. The commercial hearing aid market in the US seems to be about the same size as it was before the entry of Costco. However, Costco is a disruptor in local communities because it has taken 15 to 20 percent of the business of existing practices in those areas. By contrast, if you take the cell phone example, that caused a true growth in the market. Another example of a disruptor in our industry is PSAPs (personal sound amplification products). It appears that one and a half million PSAPs are sold annually. This number comes from estimates based on discussions with several leading PSAP manufacturers. When you consider that approximately 2.4 million hearing aids are sold commercially (excluding government sales) in the US each year, the PSAP numbers are very significant. Also, it is estimated from survey data acquired by PSAP distributors that approximately 80% of people purchasing PSAPs already own hearing aids., If this is true, we have to wonder what that says about our current models of business and whether we are driving them to try an alternative approach to resolve their hearing problems. Carolyn: That’s very surprising to me. Barry: Yes, a lot of us were thinking that PSAPs were comparable to reading glasses. That is, maybe if someone tried them and liked them, they would come in to an audiology office to purchase hearing aids. If that were the case, they would help to grow the hearing aid market. However, if that is happening, we don’t have data to show it yet. If 80% of people who are purchasing PSAPs already own hearing aids, then we’re not doing a good enough job retaining our current patients. We also know that most people buying hearing aids already own them, so we’re not making a dent in drawing new people into the market. Carolyn: How can audiologists respond to these market disruptors? Barry: That’s a great question. Before I answer it, I want to discuss the broader context for audiologists to consider. In the past several years, we’ve seen a shift from traditional, clinical practices that focus on a wide spectrum of audiological services, to practices that now focus specifically on product sales. If you look at consumer advertising, you will see that the majority of practices are promoting new hearing aid technology. And if you look at key performance indicators (KPI) today, you will see things like closing rates, sales opportunities, and average selling price right at the top of the list. When I ran a practice, KPIs included the number of ABR, VNG and auditory processing evaluations, and the number of adults versus pediatrics seen. In other words, historically, the KPIs focused on a wide range of diagnostic and rehabilitative services – not just product sales. Today, it seems that it’s all about the product and the product has become the center of our universe. We’ve also seen more and more vertical integration in the hearing care industry. Now, all the leading manufacturers also are the leading retailers, in direct competition with independent practices. By contrast, our professional organizations have initiatives to increase our autonomy. Whether it’s achieving LLP (limited licensed physician) status such as the 18 x 18 Initiative–audiologists want to be recognized as professionals that can diagnose, manage, and treat our patients. If we just sell products we are moving in the opposite direction. It’s time for us, as a profession, to get back to our historic roots of diagnosing, managing, and treating hearing and balance issues. Back to your question about differentiating our practices. We need to think about providing a full suite of services that distinguish our practices in the marketplace. We need to get back to the basics of what we’ve been trained to do, or otherwise we have just fallen into becoming sales people. That enables us to respond to disruptive forces, competition, and set ourselves apart from other professionals who may be looking to encroach on our scope of practice. That doesn’t mean that we don’t offer products, but it means that we need to offer services and care that truly set us apart in the marketplace. Carolyn: How does a rechargeable battery solution play a role in differentiation? Barry: I approach practice differentiation by asking the question, “What’s in your sandbox?” Where is your competition not playing, and how can you provide quality care for your patient that sets you apart from the competition? Rechargeable technology is a part of that. I’ve spent the better part of the past year researching the rechargeable market. If you talk to consumers and ask them what they want in terms of hearing aids, they will say they want better batteries. MarkeTrak 2008 indicated that consumers found hearing aid battery life less than satisfactory, and one of the factors that would increase the likelihood that people would buy new hearing aids was rechargeability. In 2008, a hearing aid battery lasted one to two weeks. Today, if you’re talking about a product that’s wireless and streaming, you may be changing the battery every three to four days. Amyn Amlani at the University of North Texas has looked at factors that influence patients’ decision making and purchasing. He reports that rechargeability is among the top of the list of features of what people are looking for; they want a product that’s rechargeable. He thinks rechargeability could potentially grow the market by six to eight percent. Additionally, the new MarkeTrak 9 study ranked the most compelling features sought by non-owners of hearing aids. “A rechargeable hearing aid” and “rechargeable batteries for hearing aids” were ranked #2 and #4 on their wish list. In terms of other high-end consumer products, what other products require you to change the battery every three days? It’s unheard of. Carolyn: What about profit from battery sales? Won’t practices lose revenue if they move to rechargeable solutions? Barry: Today, about 80 percent of patients are purchasing batteries outside of a dispensing practice. Historically, batteries may have been a source of profit for practices but it’s just not true anymore. We just finished a survey conducted at both IHS and ADA, as well as online, and we found that 56 percent of practices are currently giving away a one year supply of batteries – sometimes more. It’s the only way they can keep their patients coming into the office. Otherwise, the patient will purchase the hearing aid and then go to a big-box store or online to buy batteries. Based on these figures, I estimated that more than 100M free batteries are given away - every single year. Carolyn: Barry, we know there are rechargeable hearing aids already on the market. What does ZPower offer, and is that the same or different as what is currently out there? Barry: ZPower’s expertise is in rechargeable silver-zinc battery technology, which has been used, in military and aerospace applications for several decades because of its very high energy. Over the company’s 18 year history, it has improved the technology and adapted it for portable electronic applications. Hearing aid manufacturers first approached the company in 2007 requesting we develop a high energy rechargeable hearing aid battery. The result of our efforts is a hearing aid battery that doubles the run time of current rechargeable batteries available today. Silver-zinc surpasses even lithium-ion in terms of energy and is safe and recyclable. One of the complaints that we hear from audiologists who have tried other rechargeable batteries on the market is that they do not last all day. Or, they are only available from select companies, in certain products and in certain styles. 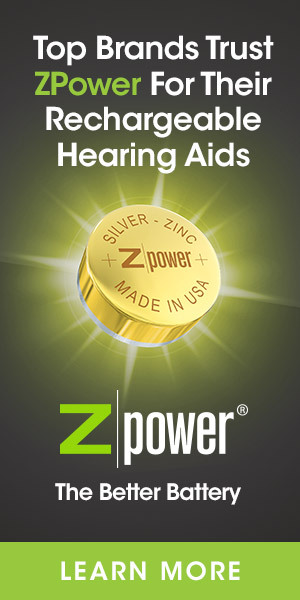 At ZPower, we knew we needed a battery solution that would last all day, be charged in the hearing aid, and a would still enable the wearer to use a zinc-air battery if, for example, they forgot the charger. We also knew we needed something that wouldn’t affect the hearing aid’s electronics and electroacoustics. For these reasons, we developed a custom rechargeable battery door module that contains the necessary circuitry to convert almost any hearing aid into a rechargeable. All you have to do is swap the standard battery door with our door to create a rechargeable solution for your patient. Carolyn: This solution will work with existing hearing aids? Barry: Yes, there are charging contacts on the bottom of the door and we provide a charger. Instantaneously in the office, by changing the battery door on a select number of new or existing hearing aids, you can make them rechargeable. Carolyn: Are the manufacturers on board with this, too? Barry: The great news is that this new solution is totally self contained and compatible with hearing aids’ existing electronics. Professionals can implement this solution right in their offices to give patients the modern day convenience of rechargeability that they expect in devices today. They can offer this solution with confidence that this new power source won’t have any impact on the technology. We certainly have taken this technology to the manufacturers, who have historically been reluctant to embrace rechargeability given its past challenges and limitations. Right now, rechargeability probably isn’t near the top of their product development roadmaps. So we are offering it directly to the people who have been asking for it – hearing care professionals, who can offer this to their patients. Carolyn: When will this solution be available? Barry: We are looking at launching at the end of summer. Silver-zinc battery technology allows much smaller sizes than the nickel metal hydride or lithium-ion. We have the capability to use our technology in a size 10 battery, but will start with the more popular 312 and 13 sizes. We’ve put a small color band on the batteries so patients will be able to distinguish them from the more traditional disposable zinc-air batteries. We’ve also put a cap on the battery so that if you try to put this battery into a hearing aid that is not ready to be rechargeable, then it won’t work. The only way the hearing aid will work with the rechargeable solution is if you use our electronics in the battery door. You just can’t buy the battery off the shelf and put it into your hearing aid. Carolyn: Are there any beta tests or clinical trials happening? Barry: Yes. We’ve been conducting many rigorous evaluations and clinical trials. We have on-going clinical trials at Vanderbilt with cooperation from one of the big six manufacturers. Patients are using this solution in high-end wireless products and wearing it 18 hours each day. It takes three to six hours to recharge the product. We’ve been running independent studies on the electroacoustics, and showing that it’s no different than running a zinc-air battery. In fact, the one comment we’re hearing time and again from patients in the clinical trials is that they don’t want to give the hearing aids back and return to using zinc-air batteries. Carolyn: How long will the silver zinc rechargeable batteries last? Barry: One silver-zinc rechargeable battery will last a full year, and one will take the place of about 50 zinc-air batteries. So for every 100 disposable batteries used annually by a binaural patient, all you need are two silver zinc rechargeable. From the audiologist’s standpoint, in terms of a value proposition, the patient will have to come back to that practice at least once a year to get replacement batteries. Carolyn: There’s your annual recall for a check up. Do you have to take the battery out to charge it? Barry: No, the ZPower rechargeable battery never has to be removed from the hearing aid, which makes the rechargeable solution really convenient for the patient. We know that many of our patients have dexterity problems and vision problems, and now they no longer have to be opening and closing the battery door. The battery stays in the instrument for a year. You never have to take it out. You don’t have to carry spare batteries. The hearing aid is just going to work. Just drop it in our charger at night, and put it on in the morning. So it’s pretty exciting. That’s the value of rechargeability. From the environmental standpoint, we’ve been recognized as a green company. It’s estimated that about 1.4 to 1.5 billion zinc air batteries go to the landfill every year. In contrast, the ZPower silver-zinc rechargeable battery is fully recyclable and we’re implementing a recycling program for these batteries. Finally, there’s the reliability factor. You don’t have to be opening and closing those battery doors. As you know, it’s not uncommon to have to change battery doors because patients sometimes damage battery doors for any number of reasons such as putting the batteries in upside down. It’s a win-win for patients and for professionals. No more lost revenue stream, no more counseling about battery changes, no more battery inventory, etc. Carolyn: What will you have in the ZPower booth in San Antonio at AudiologyNOW? Barry: In San Antonio, we are not selling any products. We’re continuing to collect data. We look forward to meeting audiologists at our booth to work with us on some of our survey data to help us better understand their needs and demonstrate the value of rechargeability. The overall end game is that we plan on working directly with the audiology and dispensing community to teach them how to convert new and existing hearing aids and make them rechargeable. We hope, in the not too distant future, that manufacturers see the value of rechargeable products, and begin to integrate this as part of what they’re selling to the audiology community. In the meantime, we’re going to support audiologists in using this now to differentiate their practices and make a difference in the lives of their patients. Carolyn: Thanks for your time, Barry. Barry: Thanks, Carolyn. Always a pleasure. For more information, please visit www.zpowerbattery.com or the ZPower Expo Page on AudiologyOnline. Dr. Freeman is Vice President of Business Development at ZPower.